On the Wednesday morning of October 12, 1921, Joseph Nigl rose from bed at his home near 9th and Ohio streets. He went to the adjacent kitchen, lit a burner on the stove and prepared coffee. He was tired. Nigl had returned to Oshkosh late the previous evening after visiting his daughter Anna in Chicago. He lounged in bed while he waited for his coffee. He fell asleep. As he dozed, the coffee boiled over dousing the flame from the burner. The house filled with gas. Joseph Nigl never woke up. The death of the 55-year-old Nigl sent a shock through the immigrant neighborhoods of Oshkosh’s Sixth Ward. 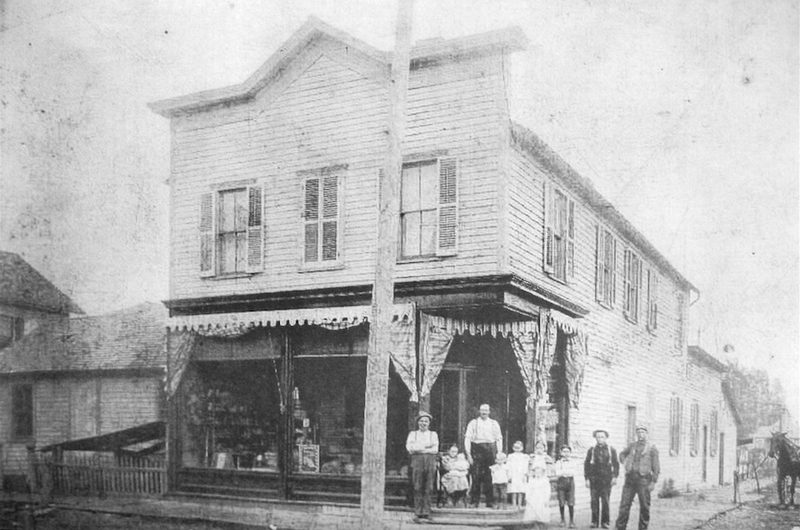 The hub of their community was Nigl’s grocery store and saloon at the northwest corner of 9th and Ohio. Like many of his neighbors, Joseph Nigl was an immigrant. Born in Bavaria, he came to America in 1872. He was six years old. In 1881, his father purchased a lot at the northwest corner of 9th and Ohio streets. 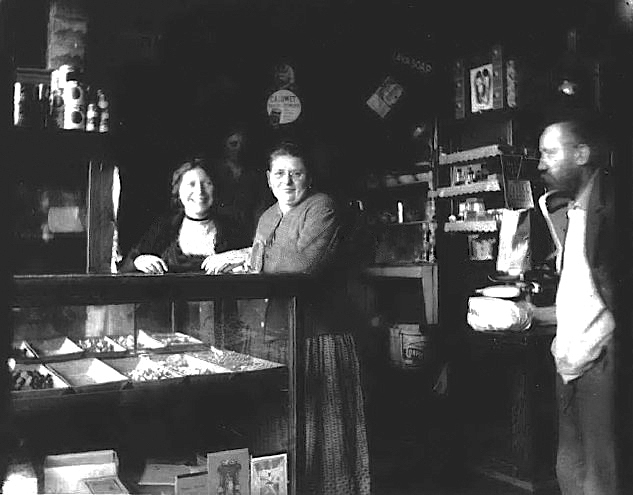 By the mid-1880s, the Nigls had a thriving business there. The family-run grocery would expand to include an attached saloon. Joseph Nigl's young adulthood was spent working there. Everybody in the Sixth Ward knew him. In 1890, he took over the business from his father. Nigl was 24. His place came to be known as the Gemütlichkeit, a German word suggesting an atmosphere of warmth, friendliness, and good cheer. Nigl flourished. He was elected alderman of the Sixth Ward and served on the County Board of Supervisors. People urged him to run for mayor. 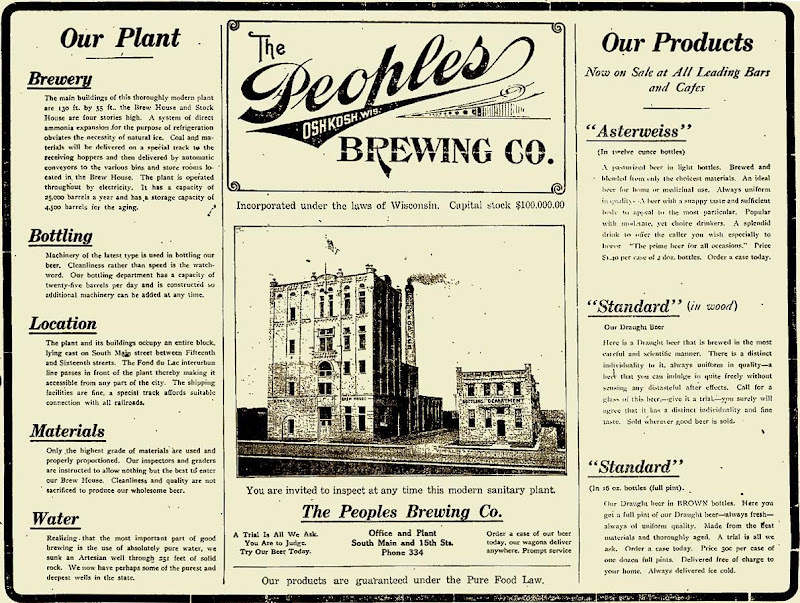 When the Oshkosh Brewing Company began exerting pressure on local saloon operators, Nigl and other saloonkeepers launched Peoples Brewing Company. When the brewery opened in 1913, Joseph Nigl was named its first president. But Nigl's life wasn't without trauma. 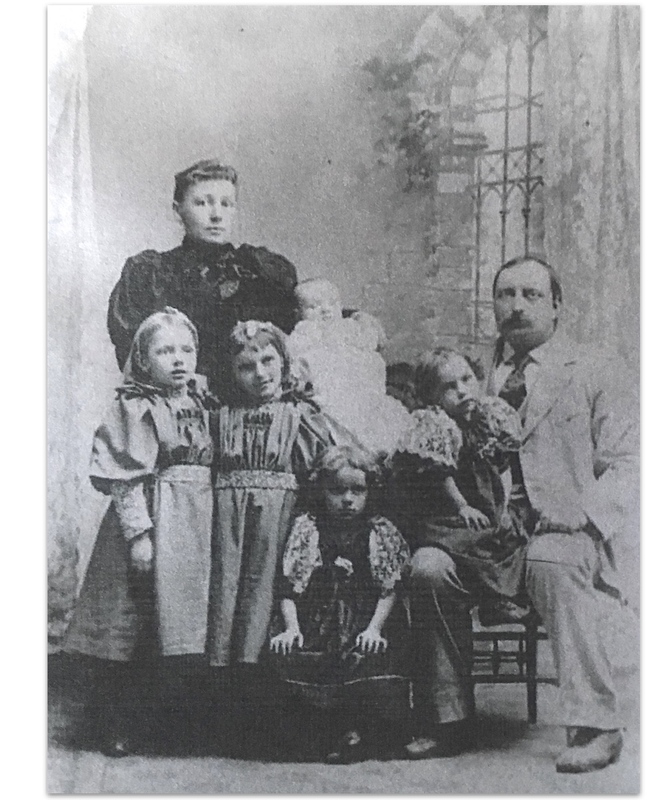 He encountered a series of trials beginning in 1899, when his wife died just days after giving birth to their sixth child. Nigl remarried. In 1905, the couple had a baby. The child was stillborn, strangled by its umbilical cord. In 1915, Nigl's second wife died. He married again. 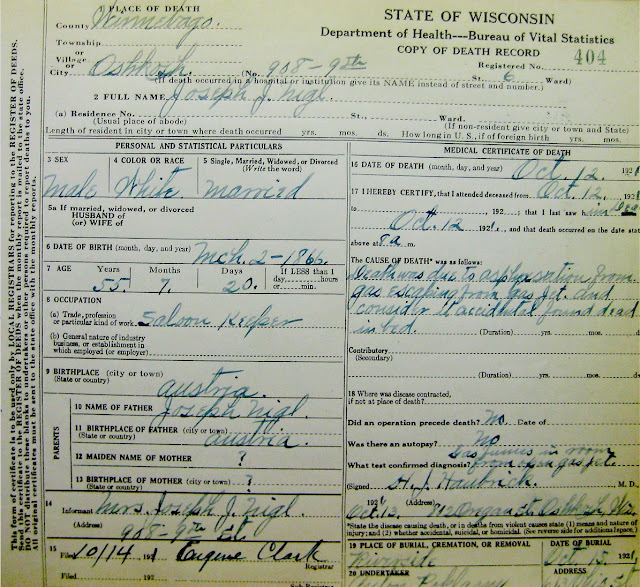 In 1921, Nigl's third wife, Emma (Gebauer), arrived home to discover her husband’s lifeless body. Emma Nigl hadn't gone with her husband to Chicago. She spent the night in Oshkosh with her ailing mother. Just before 8 a.m., Emma returned home. She smelled gas when she opened the door. Emma rushed to the stove and turned off the burner. She immediately went to the bedroom. Emma shook her husband. His body was warm, but she couldn't rouse him. Emma opened windows then hurried down a passageway that led from the house to the Gemütlichkeit where she pleaded for help. Several patrons rushed into the home. They carried Nigl onto the porch facing 9th Ave.
Nigl's porch. 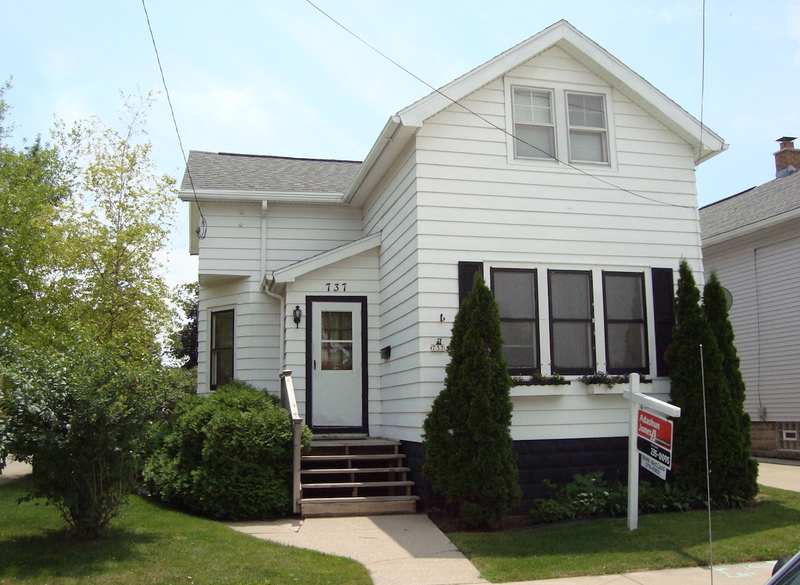 His home on 9th Ave. no longer stands. Police arrived moments later. They fit Nigl with a respirator. He remained unresponsive. A trio of doctors followed on the heels of the police. They worked to resuscitate him. Nothing. No signs of life. Nigl was pronounced dead. 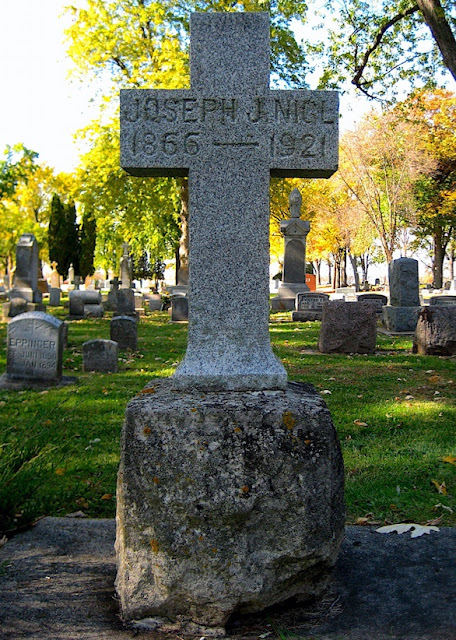 The funeral of Joseph Nigl was held at St. Vincent's Catholic Church on Saturday, October 15, 1921. The Daily Northwestern described it as, "one of the largest funerals ever held in this city." The procession ended in Riverside Cemetery. Nigl left a wife and six adult children. He also left a saloon that couldn't sell beer and a brewery that couldn't make beer. Prohibition began in 1920, a year before Joseph Nigl died. He was living in a world that had become almost unrecognizable to him. The traditions informing his life had been nullified. Nigl was rooted in an era rapidly fading. His passing made it ever more distant. I want to share a picture recently shared with me. I hadn't seen this photo before. It shows Joseph J. Nigl and his family. 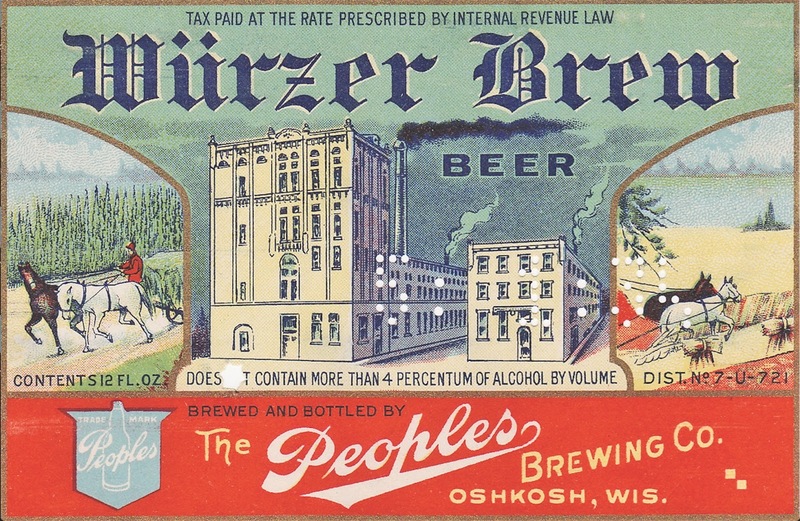 Nigl was a founder of Peoples Brewing Company of Oshkosh. This shot was taken before the brewery was launched. The Nigls sat for this photo about 1896. From the left, the four girls in front are Mary (b.1891-d.1992), Rose (b.1890-d.1976), Elizabeth (b.1893-d.1983), and Karolena (b.1894-d.1928). The baby is Joseph Nigl (b.1896-d.1970). The woman in the dark dress is Maria (Seibold) Nigl (b.1869-d.1899). Her husband, Joseph J. Nigl (b.1866-d.1921) is seated on the right. They all look quite serene. But they were headed for turmoil. Three years after this picture was taken, Maria Nigl died. Her death came six days after giving birth to her daughter, Anna. 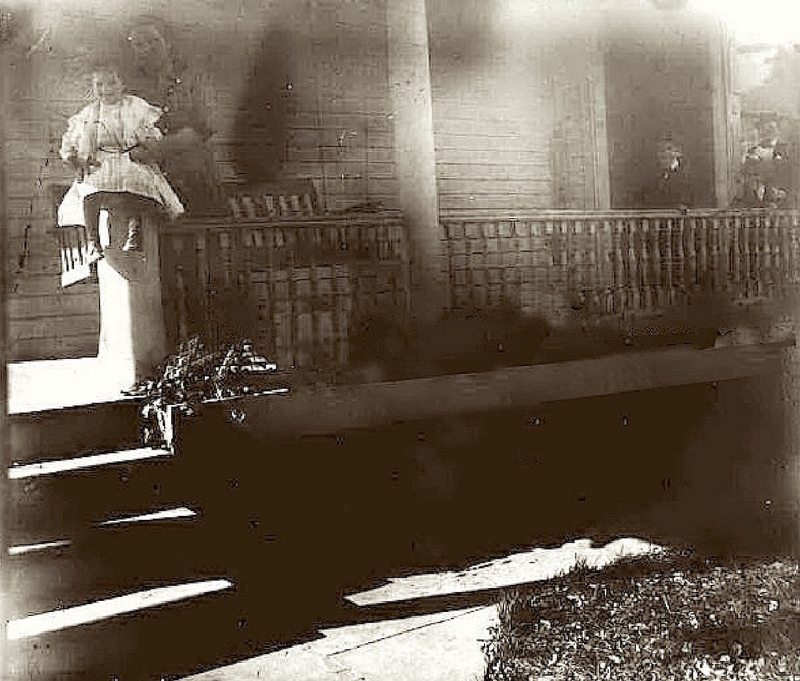 Here's a picture from 1899, near the time of Maria's death. It's a heartbreaking photo when you know its context. This is the Nigl family without mother Maria. Joseph J. Nigl is in the middle flanked by his children. The man at the far left wearing a hat and white shirt is his father. 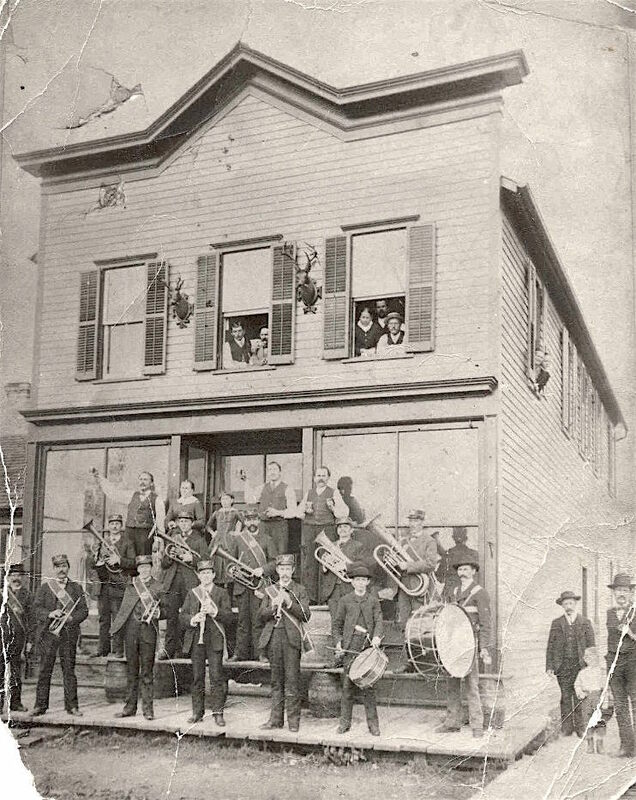 They're all standing in front of the grocery store/saloon the Nigls operated at 9th and Ohio streets. This building is now home to Ohio Street Station at 815 Ohio St. When this photo was taken, Joseph J. Nigl was struggling on several fronts. Suddenly he was widower with six children. At the same time, his livelihood was being threatened by the Oshkosh Brewing Company. Nigl's saloon, the Gemütlichkeit, had been tied to the Oshkosh Brewing Company. But OBC had decided to eliminate the middleman at 9th and Ohio and build its own saloon and dance hall across the street (that property is now the home of Nigl's at 556 W. 9th Ave). Joseph J. Nigl was being squeezed out. It wasn't long before Nigl rebounded. In the fall of 1899 he married Theresa Madl. And the squeeze from OBC would lead directly to Nigl initiating the formation of Peoples Brewing Company, which he became the first president of. Joseph J. Nigl died in Oshkosh in 1921. He was president of Peoples Brewing at the time of his death. Alex Wenzel of Lion’s Tail’s talk about his new beer and the inspiration for brewing it. 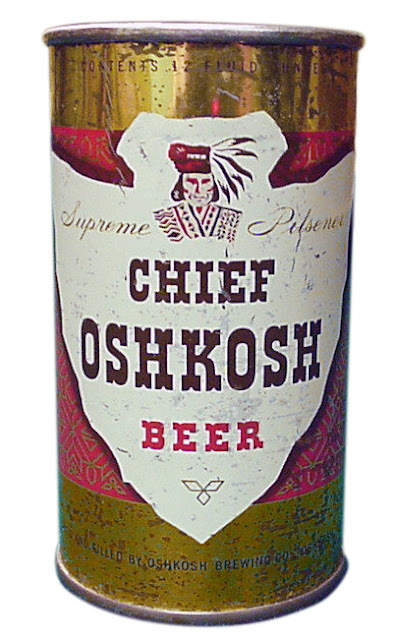 The story begins in 1949 when the Oshkosh Brewing Company began packaging beer in aluminum Crowntainer cans. 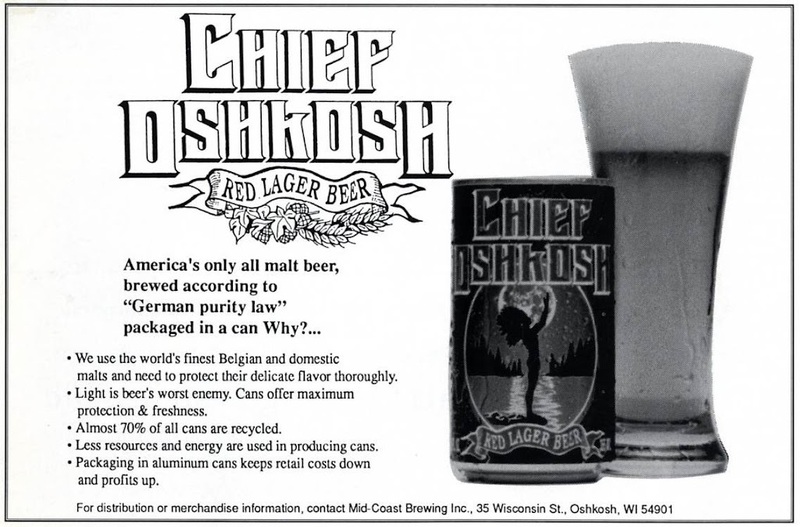 This was the first time an Oshkosh brewery sold its beer in cans. A couple years later, OBC scrapped that can in favor of the more commonplace Cone-Top style can. There was one main benefit to these funnel-shaped cans: they could be filled on a bottling line. It meant the brewery didn't have to shell out for an expensive, dedicated canning line. The downside was that these were difficult to work with and bulkier than flat-top cans. Cone tops didn't go over well in Oshkosh. Only about 5% of OBC's beer ever found its way into these cans. In 1955, OBC scrapped the cone top. The brewery purchased a canning line and began packaging beer in flat-top cans. Aside from the missing cone, the new can looked much like its predecessor. Here’s a stream of those cans going through the OBC canning line in 1956. Shortly after the new canning line was installed, OBC changed its can’s design. 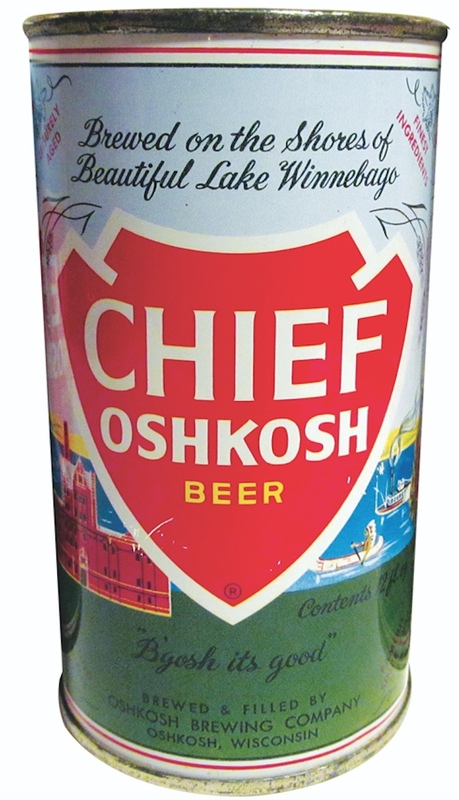 Below is the Chief Oshkosh can as it appeared from 1957 until 1961. 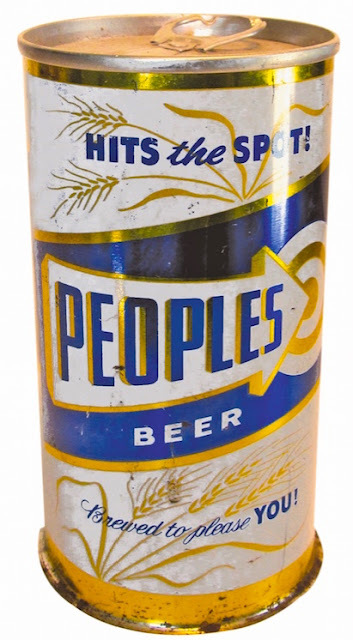 Peoples Brewing Company joined the game late. The earliest Peoples can I've come across is from 1959. But when Peoples found the design it liked, the brewery stuck with it. The Peoples can remained essentially the same until 1972 when the brewery closed. 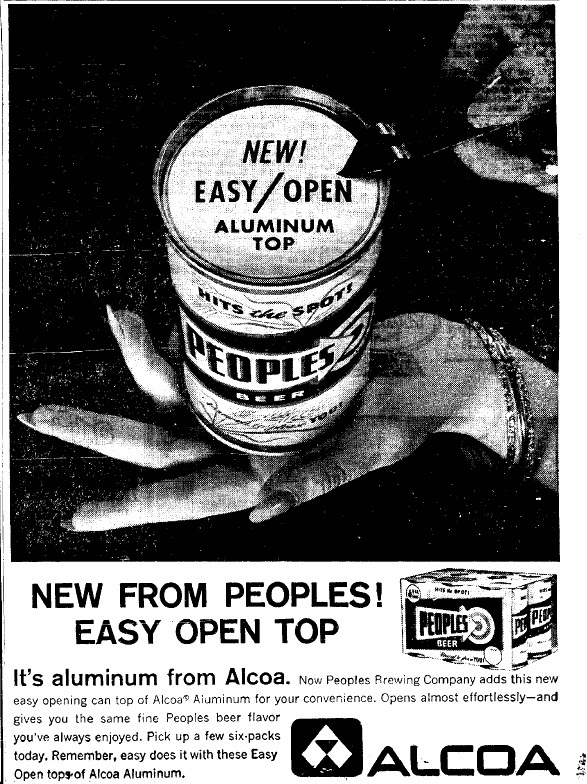 Here's an ad from 1963 when you still needed a churchkey to open a can of Peoples Beer. There would be minor changes, but the can's basic look remained the same until OBC closed in 1971. 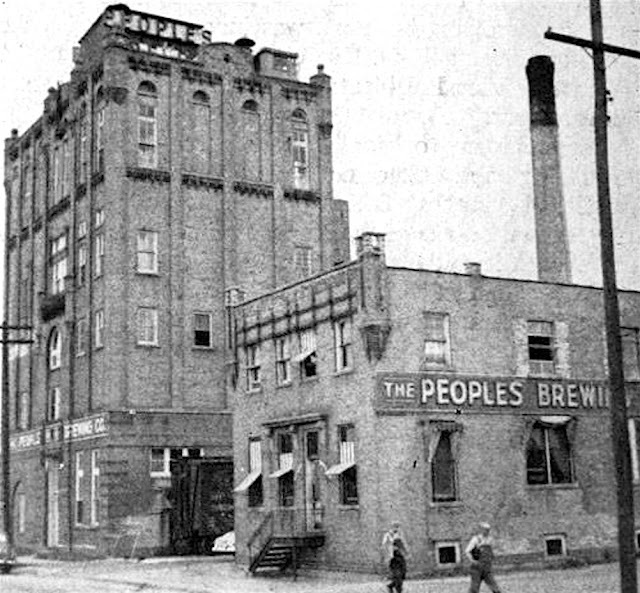 That same year, Peoples Brewing bought the Chief Oshkosh brand and continued to produce the beer until 1972. The brewer changed, the can didn’t. 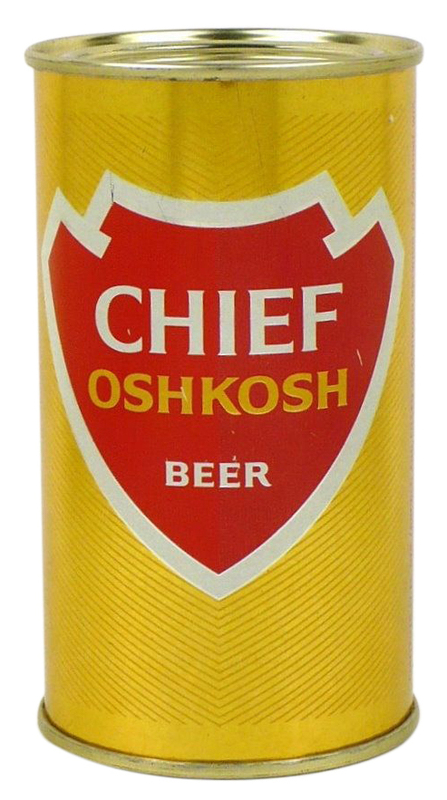 Here are a couple 1960s cans most people wouldn't associate with Oshkosh. In 1966, The Oshkosh Brewing Company purchased the brands of the defunct Rahr Green Bay Brewing Company. 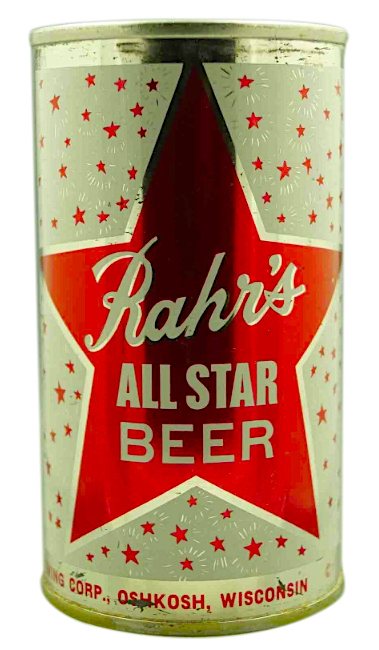 Oshkosh had also been home to a Rahr Brewing Company, though the two businesses were not affiliated. 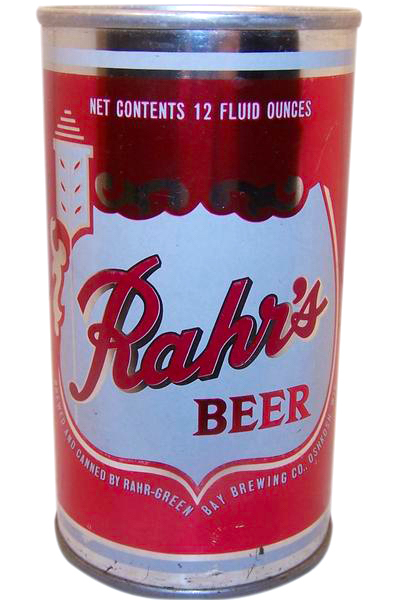 Rahr Oshkosh closed in 1956 having never canned its beer. Nevertheless, confusion reigned when people began seeing cans of Rahr beer with an Oshkosh imprint. From 1972 until 1991, the only cans you were likely to see with Oshkosh on the label were in the possession of collectors. There was, however, this oddball from 1980. That can was a one-off made by the Walter Brewing Company of Eau Claire. It was to commemorate the Fox Valley Beer Can Collector's 1st Canvention held at the Acee Deucee Tavern in October 1980. The main image is a mash-up of the Peoples, Chief Oshkosh, and Adler Brau of Appleton labels. 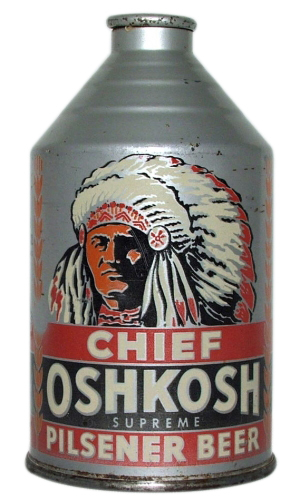 Here’s the most historically significant can associated with an Oshkosh brewery. 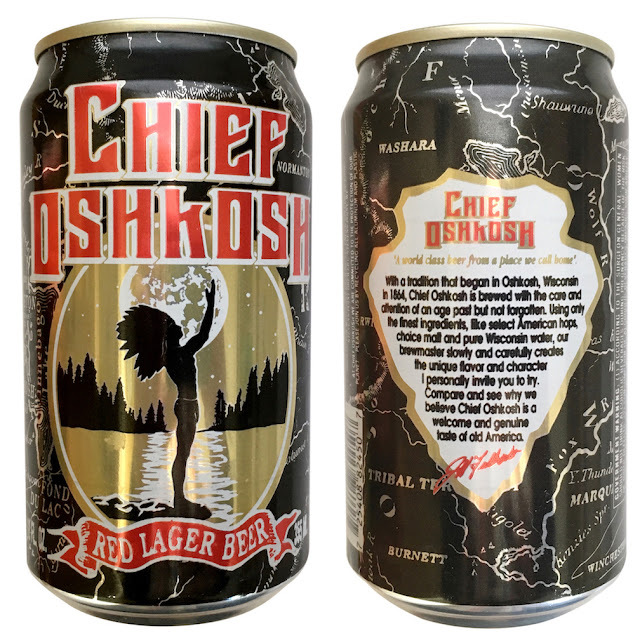 The first American craft beer packaged in a can was Chief Oshkosh Red Lager. The beer was produced and packaged at Stevens Point Brewery for the Mid-Coast Brewing Company of Oshkosh. At the time, nobody involved realized they were blazing a trail many would follow. Jeff Fulbright, president of Mid-Coast Brewing Company, made a point of extolling the virtues of cans. His 1991 message became the mantra craft brewers were reciting some 15 years later when canned craft beer came into vogue. Here's an ad from 1991. The discourse on canned beer was years ahead of its time. And that brings us around to what happened last week. On February 7, 2017, Bare Bones Brewery canned Double Dog Dazed IPA and became the first commercial brewery to can its beer in Oshkosh since 1972. That's a milestone in itself, but there are other aspects that make this unique. It's the first time an Oshkosh brewery has canned a beer in 16-ounce cans. It's the first time an IPA was canned in Oshkosh. It's the first time a double-digit ABV beer has been canned in Oshkosh. The brewer, RJ Nordlund, designed the label and the canning was done on a mobile unit owned by Midwest Mobile Canning. 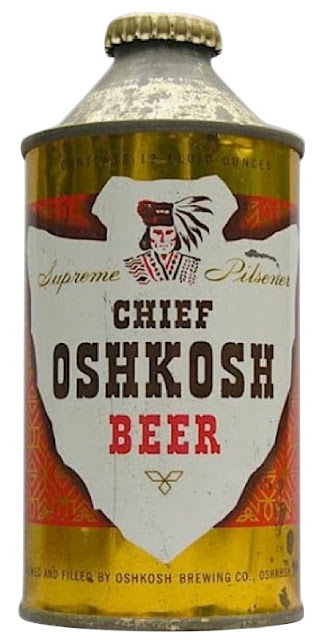 If the guys from the Oshkosh Brewing Company of 1949 could have sat in when this was being canned they'd have been shaking their heads wondering what the hell was going on. They never saw a beer or a can like this one. After Double Dog Dazed was packaged, they canned a second beer at Bare Bones. Sander Vitreus Pils is something the OBC folks would have immediately recognized. It's a pale, light-bodied lager. The beer was made for the Oshkosh Southwest Rotarians Battle on Bago fishing tournament and celebration taking place February 24 and 25 in Menomonee Park. There's an outlier I can't fail to mention. Last year Ruby Owl Tap Room installed a crowler machine that allows the gastropub to package draught beer in 32-ounce cans. The first can of beer filled at the Ruby went out the door on July 26, 2016. This is not the same as the canning operation of a brewery, but it is characteristic of our time. And a good time it is. For the first time in 45 years, an Oshkosh brewery is putting beer in cans. RJ Nordlund, of Bare Bones Brewery, talks about the return of canned beer to Oshkosh. Oshkosh Girls Pint Out is hosting a special beer release at Bare Bones Brewery Saturday, February 11 at 6 p.m. And the women from GPO are inviting everyone to attend. 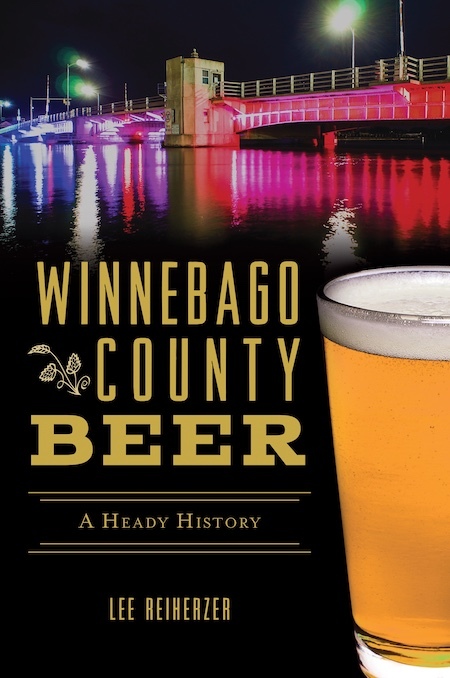 Here's the deal: Oshkosh Girls Pint Out asked Bare Bones to brew a beer in honor of Anna Windhauser, who established the first homebrew shop in Oshkosh during Prohibition in 1925. The beer, developed by Bare Bones assistant brewer Jody Cleveland, is based on the bock beers produced by Peoples Brewing of Oshkosh in the years immediately before the onset of Prohibition. There hasn't been a bock beer like this made commercially in Oshkosh in almost 100 years. Only a couple barrels of it were made, so get it while you can. Thanks to Bare Bones, $1.00 from each pint of Anna's Bock sold will go to the Alzheimers Association in memory of Anna Windhauser who was afflicted with the disease. I'll be there at 6 p.m. to give a brief talk about the life and work of Anna Windhauser (and after that, I intend to drink copious amounts of Anna's Bock). Girls Pint Out encourages folks to "Wear your best 1920's attire and join us for an evening of prohibition-era fun and dance!" For more info, check out the GPO event page here. Hope to see you there! On the Friday evening of January 6, 1922, a squad of federal and state Prohibition agents arrived in Oshkosh. They came by train arriving at the Chicago & Northwestern depot on Broad Street. There were 13 of them in all. At the station, four automobiles were waiting. The cops split into groups of three and four. Off they went. The city Prohibition forgot was about to get a wake-up call. It was impossible to ignore the dry law. That didn't stop Oshkoshers from trying. When Prohibition began in 1920, there were close to 100 licensed saloons in the city. A year later, nearly all of them were still in operation. Now they were licensed as soft drink parlors. The distinction meant nothing. An Oshkosh bootlegger interviewed in 1980 put it this way: "How many saloons sold alcohol illegally in Oshkosh during Prohibition? Only about a hundred percent." The overt disregard for the new law hadn't gone unnoticed. Neither had the complacency of local law enforcement. Police in Oshkosh had a habit of looking the other way when it came to illegal liquor. Their leniency didn't sit well with the feds. When their cars left the Broad St. station, not a single Oshkosh cop had even been brought along for the ride. The raids began at once. Each was executed in a similar manner. The building would be surrounded. An agent stationed at each exit. The other agents stormed in. It was over in a matter of minutes. 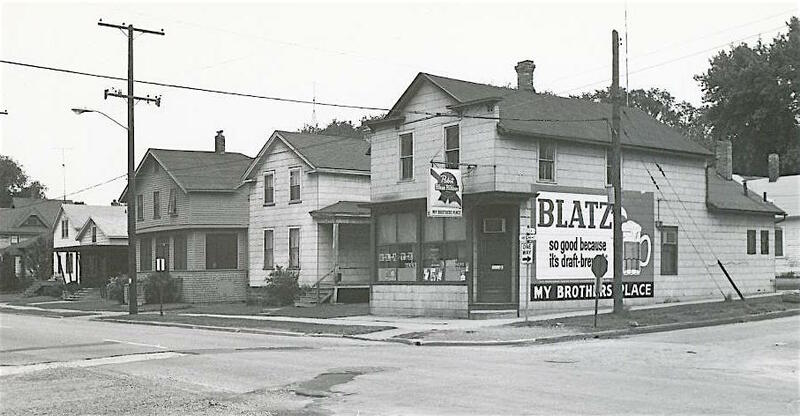 Among the first taken down was the saloon operated by Joseph Riedy at what is now 1226 Oshkosh Ave. It was the only spot where the feds encountered anything resembling resistance. When they broke in, a woman grabbed a bottle off the back bar and bolted to the apartment upstairs. The cops found her hiding in a bathroom. She was clutching a bottle of pre-Prohibition Sunny Brook Whiskey. She gave up and led them to a full case of Sunny Brook stashed in the apartment. The cops let her go. The liquor she possessed was exempt – it had been legally produced before the onset of Prohibition. Joseph Riedy, on the other hand, was in trouble. He was arrested and charged with selling alcohol in a place licensed to sell only non-intoxicating drinks. The cops kept digging. They found a gallon of moonshine and bottles of wine. Riedy had just lost his livelihood. Riedy's old saloon still stands. 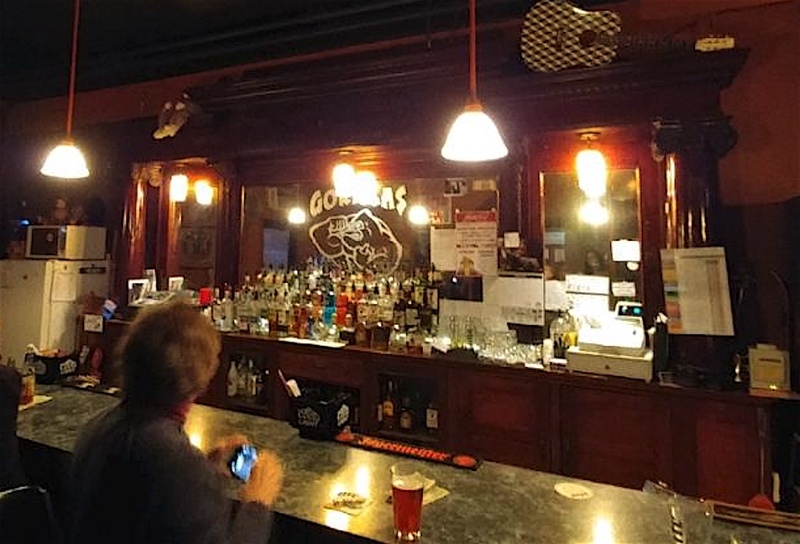 It’s now named Gorilla’s Bar. And the same back bar where the woman grabbed the bottle of Sunny Brook is there, too. Whether or not the feds realized it, there was a common thread linking two of the saloons they raided that night. While the raid on the Riedy saloon was taking place another raid was occurring simultaneously at a saloon operated by Edward Hartske. The common thread was that both places were owned by the Rahr Brewing Company of Oshkosh. 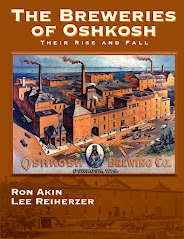 Though the Rahr family steadfastly denied it, there had been much speculation in Oshkosh that their brewery was involved with bootleggers. Perhaps the feds were sending the Rahrs a message in taking out two of their “soda parlor” speakeasies. At Hartske’s saloon the incriminating evidence was meager: a pint of moonshine sitting on the back bar. But that’s all it took. Hartske was arrested. Some might remember the old Hartske saloon when it was named My Brother’s Place. It was located at High and Osceola where Blackhawk Commons now stands on University of Wisconsin Oshkosh property. A block north of the Hartske place, the raiders made their next sortie. They invaded the Giant Grip Saloon on High Ave. and arrested bar keeper John Ludowisy. It was Ludowisy’s second arrest on charges of selling alcohol. The cops discovered four pints of moonshine hidden under the bar and a pint of legal liquor issued to Ludowisy on a doctor’s prescription. 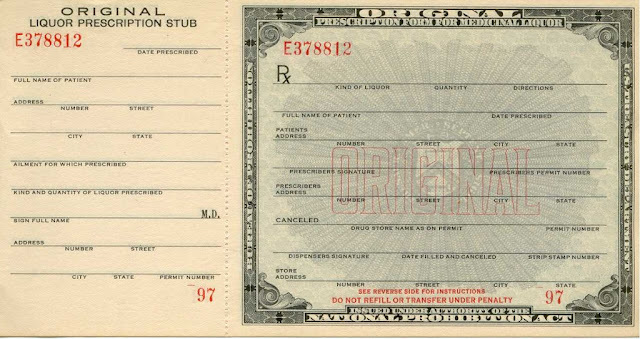 Getting booze on prescription was fairly common in Wisconsin during Prohibition. In 1922 alone, Wisconsin druggists doled out 75,000 gallons of whiskey. It was the medical marijuana of its day. The net widened as the raids progressed. The feds headed south of the river to the Higholder district where they broke into a series of private homes. Frank Kinderman was a 25-year-old frog farmer living near the corner of 10th & Knapp. He made moonshine on the side. When the cops burst in they discovered Kinderman, a 10-gallon still and two gallons of ready moonshine. Kinderman was in the midst of producing his next batch. He had four barrels going holding 200 gallons of fermenting mash. The largest haul of the evening was at Frank Penzenstadler's home at what is now 737 W. 5th Ave. Penzenstadler had a day job carving headstones. In his spare time, he made moonshine. The feds caught him with 12 gallons of “white mule” on hand and 400 gallons of mash in various stages of fermentation. Had Penzenstadler not been interrupted, his mash would have produced about 90 gallons of moonshine. By 11 p.m. the last of the raids had ended. Other takedowns were planned, but when the cops arrived they found the places vacated. Word traveled fast through the city’s underground booze ring. In all, 20 saloons and residences were raided. Twelve men were arrested. Most of them faced either 90 days in jail or a fine of $250, the equivalent of about $3,500 today. In each case, they opted to pay the fine. The onslaught came as a shock. It was the first wholesale raid in this city. It wouldn’t be last according to C.M. Perry, the assistant federal prohibition director who led the raids. He promised it was just the start of a cleanup that would take place in Oshkosh. That was wishful thinking. Prohibition lasted nearly 14 years. 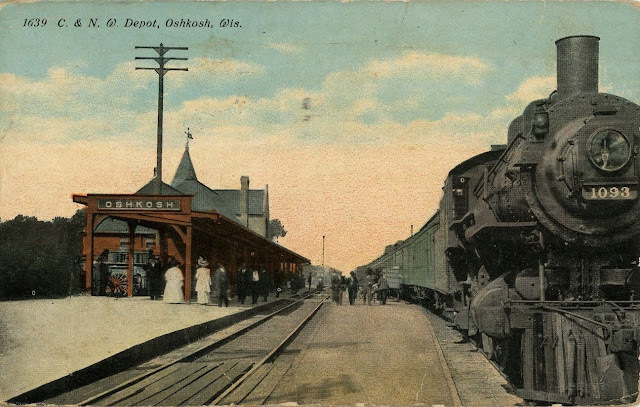 Oshkosh remained soaking “wet” straight through to repeal in 1933. Almost a century later, the entire affair seems pathetic. There was a cruelty about it. It amounted to little more than a troupe of plundering cops swarming into town to invade the privacy of people whose harmless behavior had been made criminal by an intolerable law. The arrest of Edward Voelkel exposed the ruthlessness that informed the endeavor. Edward Voelkel was born in Oshkosh in 1874. His parents were German immigrants. He’d been working for the Oshkosh Brewing Company since 1897. Voelkel was a brewer now, having made his way up from the damp beer cellars into the brewhouse. He lived a short distance from the brewery at what is now 168 Brockway Ave. with his wife Anna and their four children. On the night of the raid, Voelkel was spending a quiet night at home. Then the cops broke in. What they found amused them. 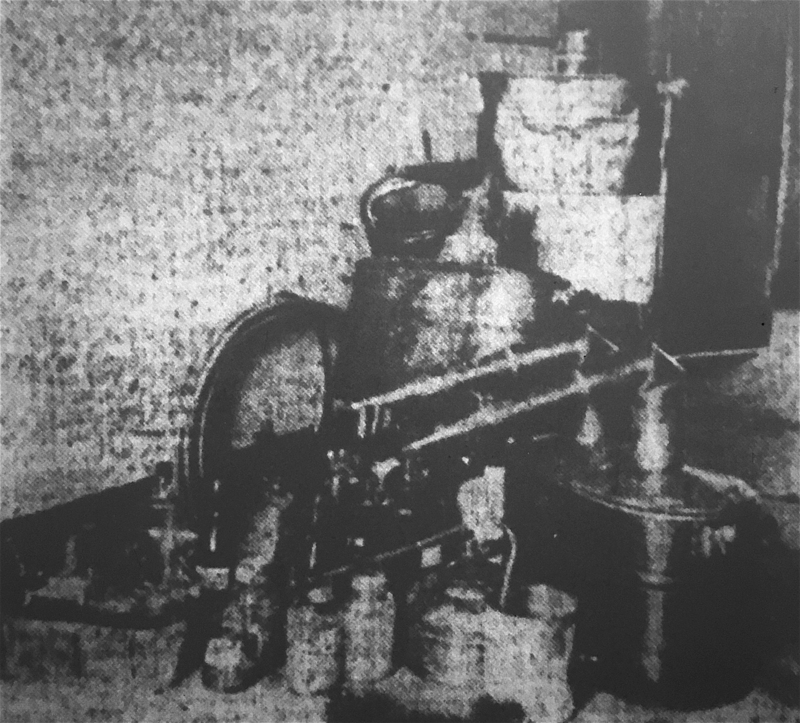 Voelkel had made a small still from a tea kettle, a pint jar, and a lead coil. He used a paint pail for a cooling vessel. The rig was small enough to sit atop his stove. The cops searched the home. They found no alcohol. Voelkel was arrested anyway. He was charged with possessing paraphernalia for making liquor. By that standard, they could have arrested almost anyone. Voelkel protested saying he had rheumatism and was only making a small quantity to ease the pain in his joints. Too bad. Zero tolerance. The next day, while the leader of the raids was boasting of their exploits to the press, he mentioned that Voelkel's was the smallest still they had yet to see. He thought it was cute. A more decent person would have been embarrassed.